Having written for 2000 AD for several years, this was my first work on a comic for children, although the transition turned out to be easier than expected. Thanks to my young daughter, I was well-versed in the latest animated movies by Disney and Pixar (every one of them a masterclass in visual storytelling). This was probably the first time since my teens that I’d watched a set of movies repeatedly and found myself learning something new with every viewing! What these movies understand is that stories for children must be as rigorous in terms of drama as anything for adults. So it’s no longer enough to fill the pages of a kids’ comic with lasers, monsters and characters walloping each other, and expect that to be enough. Every wisecrack needs to be motivated, the characters need some kind of arc and the story needs to make logical sense (even when it’s completely crazy). With TMNT, the emphasis had to be on gags, bizarre mutants and cool action with inventive choreography. I also had to write within the tight parameters of the show, i.e. what you can and can’t do with Mutagen, at what point the story took place within the continuity of the series. (‘Sorry, Alec. We can’t use the Turtle-blimp. That got blown up at the end of Season Three...’) However, the show’s premise was so cleverly built and the dynamic between the four brothers and their sensei so well calibrated that my stories pretty much wrote themselves. My favourite story is probably The Mighty Multi-Mutant, which resulted from a competition the comic ran with Tesco in which readers had to design an evil mutant using the various body parts of characters from the show! I had to incorporate the winning entry into a story, along with a guest appearance from the winner herself! 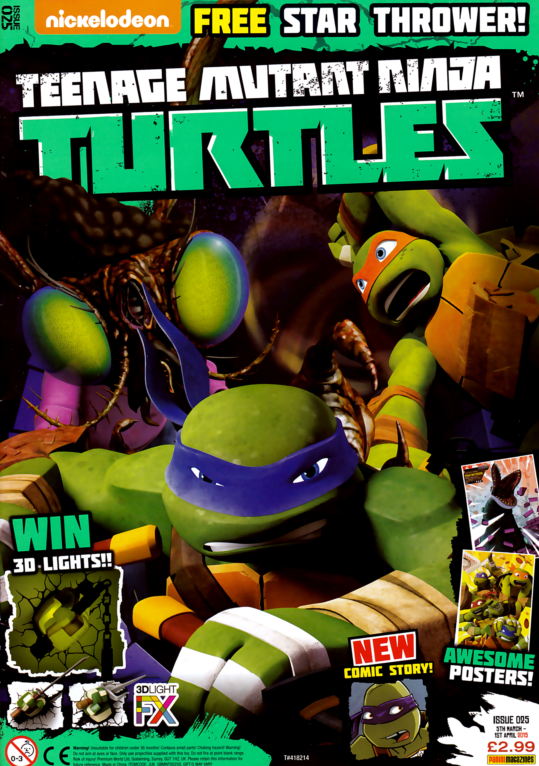 Printed in the UK and translated all over Europe, Teenage Mutant Ninja Turtles become one of the UK’s best-selling originated comics for children. My scripts received enthusiastic feedback from the license-holders Nickelodeon and I worked with some fantastic artists including Ryan James Neal, Bob Molesworth, Iain Buchanan, Cosmo White and Lee Sweeney. I enjoyed a steady three-year run on the title before the TV show concluded. But this wasn’t my last comics assignment for younger readers, as I was soon commissioned by Panini again to write Star Wars, and by Rebellion to work on the Scream and Misty Specials and an all-ages Strontium Dog for 2000 AD’s 2018 entry into Free Comic Book Day. Twelve-page one-shot, with art by Iain Buchanan, colours by Kat Nicholson and Jason Cardy, colour assist by R. Hogan and letters by Alex Foot, in Teenage Mutant Ninja Turtles #33, October 2015. The Purple Dragons have got their hands on an experimental spray-paint. Suddenly their graffiti can take on a life of its own, as the turtles find out. During a battle with bug-headed scientist Baxter Stockman, the turtles unwittingly unleash a techno-chip that can turn humble machines into war-bots - anything from an ice-cream truck to a porta-potty. Six-page one-shot, with art by Walter Carzon, colours by Kat Nicholson and Jason Cardy, colour assist by R. Hogan and letters by Alex Foot, in Teenage Mutant Ninja Turtles #35, December 2015. The turtles take it in turns to tell a creepy campfire tale that ends in the biggest scare of all. Twelve-page one-shot, with art by Bob Molesworth, colours by Kat Nicholson and Jason Cardy, colour assist by R. Hogan and James Stayte, and letters by Alex Foot, in Teenage Mutant Ninja Turtles #36, January 2016. Recuperating in the countryside following the Kraang invasion of New York (at the end of season two), the turtles must rescue Mikey from the clutches of a mutant owl with spectacularly gross powers. Twelve-page one-shot, based on an idea by Krystal Cheung, art by Ryan James Neal, colours by Kat Nicholson and Jason Cardy, colour assist by R. Hogan and J. Stayte, and letters by Alex Foot, in Teenage Mutant Ninja Turtles #38, March 2016. In the summer of 2015, the TMNT comic teamed up with Tesco and ran a competition for readers to design their own ‘Ultimate Baddie’. The winning creation starred in this strip in which Shredder concocts the ultimate mutant. His creation runs amok until Mikey finds an unlikely way of defeating it (with a little help from the competition winner who makes a guest appearance in the strip). Twelve-page one-shot, with art by Ryan James Neal, colours by Kat Nicholson and Jason Cardy, colour assist by J. Stayte and R. Hogan, and letters by Alex Foot, in Teenage Mutant Ninja Turtles #39, April 2016. Mikey accidentally infects a pumpkin patch with mutagen, creating an army of terrifying ‘Scare-bros’ intent upon the turtles’ destruction. Twelve-page one-shot, with art by Ryan James Neal, colours by Kat Nicholson and Jason Cardy, colour assist by Randy Hogan, and letters by Alex Foot, in Teenage Mutant Ninja Turtles #42, June 2016. Obsessed with pirates following an all-night movie marathon, Mikey is overjoyed when the turtles uncover a Kraang plot to gather human test subjects in a sky-ship! Twelve-page one-shot, with art by Iain Buchanan, colours by Kat and Jason Cardy, colour assist by Randy Hogan, and letters by Alex Foot, in Teenage Mutant Ninja Turtles #44, August 2016. The turtles befriend a crustaceous fellow mutant who helps them investigate rumours of monstrous sea creatures, which have been threatening the local fishermen. Twelve-page one-shot, with art by Cosmo White, colours by Kat Nicholson and Jason Cardy, and letters by Alex Foot, in Teenage Mutant Ninja Turtles #46, October 2016. Now on a mission throughout time and space (following the apocalyptic finale of season three), the turtles join a pair of eccentric steampunk adventurers on a mission to destroy the nefarious Cogfather and his clockwork battle station. Twelve-page one-shot, with art by Ryan James Neal, colours by Jason Cardy and Kat Nicholson, colour assist by J. Stayte and R. Hogan, and letters by Alex Foot, in Teenage Mutant Ninja Turtles #47, November 2016. The turtles enjoy a much-needed vacation when they are invited to attend the opening of the galaxy’s greatest water park, only to learn the park is not all that it seems. Twelve-page one-shot, with art by Bob Molesworth, colours by Kat Nicholson and Jason Cardy, colour assist by Rob Smyth and R. Hogan, and letters by Alex Foot, in Teenage Mutant Ninja Turtles #48, December 2016. The turtles receive a distress signal from a gang of strange alien creatures pursued by a fearsome monster, only to find they what they believed to be a distress signal was actually something else. Twelve-page one-shot, with art by Lee Sweeney, colours by Jason Cardy, colour assist by Randy Hogan, and letters by Alex Foot, in Teenage Mutant Ninja Turtles #53, May 2017. Having returned to earth (in the middle of season four), the turtles reluctantly join forces with Rocksteady and Bebop when they all become infected by a mutagenic shampoo, and a creature that can only be described as ‘Hairnado’ threatens the city! Twelve-page one-shot, with art by Iain Buchanan, colours by Jason Cardy, colour assist by Randy Hogan, and letters by Alex Foot, in Teenage Mutant Ninja Turtles #54, June 2017. Mikey falls foul of an interdimensional travelling circus and its evil leader, the Ringmistress. Twelve-page one-shot, with art by Bob Molesworth, colours by Jason Cardy, colour assist by Randy Hogan, and letters by Alex Foot, in Teenage Mutant Ninja Turtles #56, August 2017. When a sinister video game zombifies the turtles, it’s up to newly qualified ninja April O’Neil to save to the city from zomebiedom. Twelve-page one-shot, with art by Lee Sweeney, colours by Kat and Jason Cardy, colour assist by R. Hogan, and letters by Alex Foot, in Teenage Mutant Ninja Turtles #58, September 2017. Hothead Raph must learn to control his temper after letting super-cool criminal Hun goad him into a duel at an unexpectedly dangerous location. Teenage Mutant Ninja Turtles images © Viacom Overseas Holdings C.V. © Viacom International Inc. All Rights Reserved. Based on characters created by Peter Laird and Kevin Eastman.